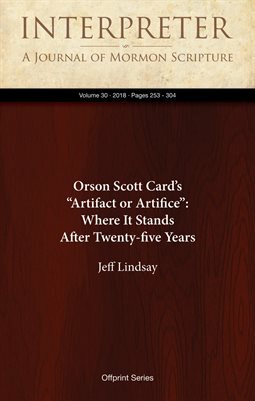 Abstract: When Orson Scott Card wrote “The Book of Mormon: Artifact or Artifice?” in 1993, he applied keen skills as an author of fiction to help readers understand how to detect the many hidden assumptions an author brings into a text. Subtle details such as the choice of what to explain or what not to explain to readers can quickly reveal the era and environment of the author. The value of Card’s analysis is reconsidered in light of extensive Book of Mormon studies since 1993 and found, for the most part, to have withstood the test of time well, like the Book of Mormon itself.